The Tale of Peter Rabbit. Theater/Classroom play for PreK-3rd Grade. 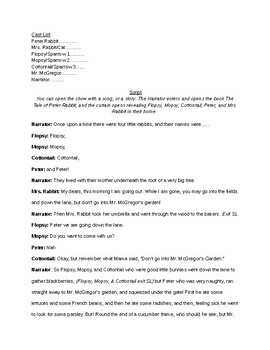 Adapted from the book, this s perfect for a children's theater program, a classroom, summer camp, etc. This version runs about 10-15 minutes, and can be adapted to be as simple or complex as you wish! 11 Characters. Can cast 11 roles, or 7 if smaller roles are double cast as listed.